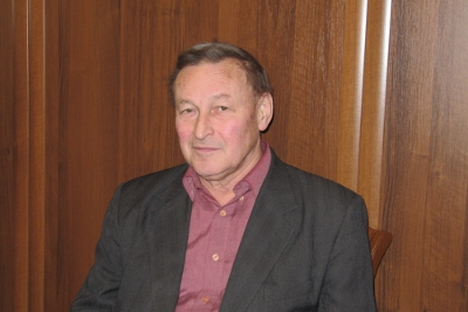 Professor Oleg Vasilyevich Malyarov, the eminent indologist and a multifaceted personality unexpectedly passed away on the very day of Easter in his village house in Novgorod district. In his demise while India lost a sincere friend, Russia lost a great patriot, a leading Marxist scholar, brilliant economist and a valiant fighter for social justice. Malyarov, born in Vladivostok, had received his higher education from the prestigious economic faculty of world famous Moscow State University. He was posted in India from 1958 to 62 as representative of Soviet state committee on economic cooperation with foreign countries after completion his post-graduation in economics. He became so deeply involved with India during this period that he never looked at any other nation for his country specialization. This was the aftermath of the period when India and USSR discovered each other for a mutually beneficial productive partnership following India’s first Prime Minister Jawaharlal Nehru’s historic visit to the former Soviet Union and Soviet leader Nikita Khrushchev’s return visit to India. Nehru after western snub to provide assistance for India’s industrialization with an emphasis on building heavy industry in the state sector found a perfect partner in the Soviet Union, which readily agreed to extend that assistance and in return found a partner for peace in the atmosphere of war mongering of the western countries in an increasingly bipolar world. Khrushchev emphasized on providing economic and technological assistance to India in order to make it the pivot in his crusade for peaceful co-existence, and instructed reinforcing the Indian direction of Soviet foreign policy that included opening of a special school in Moscow with particular emphasis on education about India and strengthening research on that country. Malyarov, who had by then fell in love with India, joined the Institute of Oriental Studies in 1966 after specializing on Indian economy. Since then he never looked back. Almost half a century of his life was fully dedicated to studies on India, particularly research on Indian economy .He has written volumes on Indian economy, but his monumental works on India ‘s industrialization, its planning process, budget-making process, foreign trade, mixed economy concept etc brought him immense repute at home and abroad. He has authored more than 200 research papers. However his magnum opus was two-volume “Independent India: evolution of its socio-economic model“ published in the year 2010. He published his last research work on Indian economic management shortly before his sudden and untimely demise. Apart from research, he was engaged in teaching Indian economy in various prestigious educational Institutions of Moscow. In the initial years of proposed Soviet assistance to India’s economic development, there was an intense internal debate among Soviet scholars as to the usefulness of Soviet help to a capitalist country. While the dogmatist Marxists questioned the wisdom of providing economic assistance to capitalist India, pragmatists strongly argued in favour extending assistance for India’s socio-economic development. Professor Malyarov always firmly stood with the second group. Based on the experience of Soviet directive planning and India’s indicative planning, Malyarov strongly advocated for a mechanism that combines market and plan, a concept that caught the attention of many Soviet scholars in 1980s, particularly during perestroika years. Prof Malyarov remained a great votary of this concept and fought for its implementation in post-Soviet Russia till his death. He was one of the leading advocates of using Indian experience in Russian economic development process and has presented many scholarly papers in numerous conferences. While most of the anti-liberal school in Russia usually argues in favour of using Chinese experience in Russian development strategy, Professor Malyarov was in the forefront of those who strongly advocated for taking advantage of Indian experience while crafting Russia’s development model. Today, there is hardly anybody who speaks in support of Yeltsin’s ill-conceived shock-therapy reforms that spelt a disaster for Russia in 1990s. Even the very people who were associated with the drafting of this disastrous economic reform programme that led to Russia’s virtual de-industrialisation have distanced themselves from it. This programme also in many ways undermined mutually beneficial cooperation between our two countries in the decade following Soviet break up. However, Professor Malyarov from the very beginning was vociferous in criticizing and denouncing these economic reforms. He was one of them who had predicted doom for Russian economy unless there is course correction in Yeltsin-Gaidar’s neo-bolshevic shock-therapy reforms. He waged a relentless battle against the market fundamentalists and strongly argues in favour of combining state planning and market mechanism. He, along with Russia’s most promising new generation economists like academician Sergey Glaziyev, currently President Putin’s economic advisor, have been tirelessly working for drafting an alternative development strategy for Russia based on innovation–led growth and justice in the framework of planned development. While he talked about planning, he meant indicative planning, and when he talked about market, he meant regulated market. He was a vociferous critic of so called “free market” and stood for a regulated market supplemented by instruments of planning. Professor Malyarov’s views have been vindicated by the worst ever economic crisis faced by world capitalism over last several years. While the world in the aftermath of all-pervasive crisis of neo-liberal, free-market capitalism is in search of new development paradigms; Professor Malyarov’s concept of combining plan with market may suggest prudent alternative and a way forward. Professor Malyarov is no more. A pal of gloom descended on JNU campus when the news of his death reached here. He shared very close association with leading Indian economists like late Sukhomaya Chakravarty, Arjun Sengupta and K.N. Raj etc. He was particularly popular in JNU campus among many of its faculty members. He would be greatly missed here. Professor Arun Mohanty is Chairperson, Centre for Russian and Central Asian Studies, School of International Studies, Jawaharlal Nehru University, Delhi.